Unlike last year, when the rains fell on 1 September, this month the ground was parched and dry. No rain fell in September 2014 and both grazers and browsers are having a tough time. The condition of the veld is deteriorating rapidly. The old, sick and weak are moribund and the presence of well-fed vultures is testimony of abundant food. 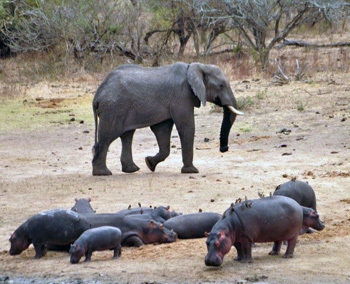 For us, it is a great time for game viewing as the animals are fairly easily found, located around water points, usually in a radius of 3 or 4 kilometres. I am told that the Viva Safaris guides did not miss lion sightings once on any safari to Kruger during the entire month !! Guests have become blasé about elephants and buffalos – these are being seen in their hundreds. Of course there is a downside as well : clients at Marc’s Camp are disturbed by the poor condition of the local Nyala herds. The Nyala are naturally tame at Marc’s and now they are concentrated along the river as well as the watered gardens around the swimming pool. The resident leopard at Marc’s has been having a feast of nyala meat – while I was at the camp I came across a kill not more than 15 metres from treehouse 7 ! At Tremisana we have had regular visits from lions, elephants and buffalos that come to drink at Tremisana Dam and at the waterholes in front of the Lapa. The dam still has water thanks to the supply from our solar-powered borehole. September was heritage month and Sandra and I took some of our staff into the Kruger Park for a day visit – all were happy to see lions three times (once with a waterbuck kill) as well as elephants, buffalos and sightings of White Rhino twice. The lowveld vegetation is dry this time of the year and there are many animals visiting water holes on a daily basis. The seasonal rivers still have water in places. The Timbavati River is one of these and animals like to feed along the river because the vegetation is green. This time of the year is very good to do safaris because the grass is short and natural watering holes or dams are dry. It is easy to track animals and to spot them from a distance. Around Tremisana Lodge some animals come to drink water in front of the Lapa. Sometimes while the guests eat breakfast they have a chance to see animals drinking water right in front of them. The monkeys are always around stealing food from the breakfast area. Some of the common animals at Tremisana are buffalos, impala, giraffe and elephants. It was early in the morning – everyone was happy and excited about walking in the bush. We went on top of a hill to watch the sun rise and to listen to the sounds of the bush. The silence of the bush was broken by the sound of elephants moving through the bush breaking some trees. They were very close to us and we moved away ten metres to try to get a better view. The elephants moved out of the bush and continued feeding. We walked away before they could pick up our scent. Along the way we found white rhino spoor that we followed for half an hour. It was moving towards a spruit or stream, and, before we saw it, we had an oxpecker taking off and making plenty noise. I stopped to listen carefully to make sure it was safe to approach. I asked everyone to be quiet and extra vigilant. We moved slowly towards the rhino and stopped behind a tree. Everyone saw it very close and enjoyed the sighting. It was a very good walk and successful approach. It was very hot day and I was ready to make the guests happy by showing them many animals and deliver what they booked for. Our first sighting was of two big bull elephants drinking water at Orpen pan. After drinking they walked towards the road to cross in front of us and they moved into the bush. Along the way to Satara there was general game like zebra, giraffe, waterbuck, impala and lots of elephants. I tried to visit many dams; the first dam was Nsemani. There were many animals around the dam and hippos outside the water. After few minutes a group of baboons arrived and started to feed around the dam. One of my guest spotted a lioness from a distance coming down to the water and the baboons started making a noise to warn other animals about the lioness. There were zebra drinking water on eastern side of the dam. They moved away immediately after the baboons gave them a warning call. A large number of elephants arrived as well to swim and drink and one elephant bull was unhappy about the lioness. 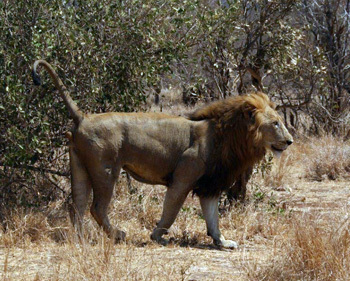 He walked towards the lioness and chased her for a long distance to make sure she was gone. This month I have only conducted 4 game drives in Balule. On one of those drives I was fortunate to encounter 3 white rhinos grazing in the early morning – one bull with 2 cows. The cows were quite relaxed as we approached as they decided it was nap time and lay down approximately 15m from the vehicle. The bull however was more curious and continued to graze while moving towards us. We think he was more focused on his breakfast because as he looked up he realized how close he moved to our vehicle and scared himself and retreated to the safety of the cows and lay down next to them. Nsemani Dam is the place to be this time of the year. As the seasons are changing with a mixture of hot and some overcast days, you can almost predict sightings at this productive dam. If it is a hot day it is almost guaranteed a herd of elephants will be drinking/swimming/mud bathing. You might be lucky enough to have a breeding herd cross the road in front of the vehicle then make their way with youngsters to the water hole. If it’s not the breeding herds at the water hole, you will find the bachelors asserting their dominance towards each other, whilst the younger bulls are waiting patiently for their turn. It is such a wonderful sight when the younger bulls come to play in the water. You can see them disappear in the dam with nothing but a trunk sticking out of the water. They splash about, roll over on their backs, and throw mud all over themselves trying to keep cool while the temperatures are reaching 37-40°C. On the cooler days this place is cat heaven. This month alone I have had 6 sightings of lions here. Mainly they are just sleeping amongst the bushes and rolling over every so often or we can be lucky enough to see them get up and move 5 metres and lie down again. On the 22nd Sept Luke and I had possibly the best lion sighting with our guests at Nsemani Dam. About 2km before the dam we had a cheetah chilling under a knob thorn tree, then four Southern Ground Hornbills came out from behind the bushes and the Cheetah went into stealth mode and stalked these endangered birds. The hunt was not successful as the birds sensed its presence and moved away, so the Cheetah went back to sleep. As we drove up to the dam we were abruptly halted as we had to wait for a breeding herd of elephants thirty strong crossing the road in front of our vehicle, then only to be amazed at what we saw on the other side. 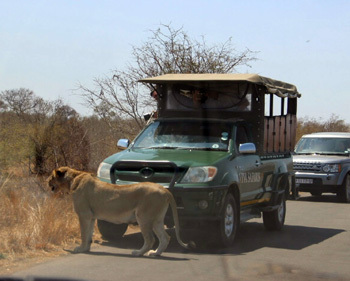 A female lioness was standing in front of Luke’s vehicle. The lioness was using his vehicle as cover whilst she was stalking impala. She then walked around the side of my vehicle allowing my guests to get nice and close to her. She came so close to my window that if I was able to put my hand out of the car I could have patted her. She moved into the direction of the impala, so both Viva Safaris vehicles followed her for about fifteen minutes. I came back around the dam wall only to find four male lions crossing the road. They too came very close to our vehicle and we had the perfect view for when they found their spot to lay down approximately fifteen meters from the road. In the meantime there are two breeding herds of elephants splashing and drinking in the dam, with hippos also surrounding the banks. The male lions became mobile once more and again crossed the road in front of my vehicle. We had four males and two females cross whilst the dominant male continued walking down the middle of the road. Our vehicle was directly behind him, he then moved off to the side and we were driving parallel with him. We stuck with him for a while then gave the other Viva vehicle behind the opportunity to pull in front of ours so they can have their experience with him. Both vehicles were getting a true taste of the lions in the Kruger Park and were extremely happy however slightly nervous at the size of the Kings of the Jungle. In addition to elephants and lions, the Rhinos have also become quite a delight towards the end of the day as it starts to cool down. Quite often along the Orpen Road in the river bed you can find a big bull grazing and drinking. This rhino deserves a modelling career because he is so photogenic as he holds the poses in the perfect angles and perfect sunlight positions. The guests always marvel at the beauty of this big male and his beautiful horns. In this same riverbed on a cooler day, Louis and I had a magnificent sighting of a male Leopard on the move along the banks. Our sighting lasted about 10 minutes as we watched in awe as the leopard move towards us and along the road. The lighting for photos was not great, however to have this sighting in the memory bank and is truly something to hold onto. This being my second Leopard sighting for the month, as Luke had eagle eyes 2 days earlier and managed to catch the tail of a leopard on the move along S6 / S125. This leopard found a comfortable spot on a rock approximately 10 metres from the road allowing us to have great viewing and the opportunity to take some fantastic photos. At Tshukudu every drive I have been on we have always got the big five plus the Cheetah. The guests quite love this place and always come away very happy, especially after the male lion roars to the sound of the revving car engine. The guests also enjoy the Cheetah petting. One drive in particular deserves quite a mention because for me it was a very educational experience in terms of animal behaviour. A mother white Rhino and her calf were confronted by 2 bulls. One of the bulls started attacking the young 1yr old calf. The calf was also a male. The mother was defending the calf and it turned into quite a serious fight. There was head butting, kicking and pushing eventually resulting in the bull showing signs of submission by lying down on his back legs. My interpretation of the scene was that the bull was threatened by this young male calf and wanted to defeat the calf before he would grow to become a threat, also to take out this calf so that the mother would be ready to breed again but with his genes. After the bull was defeated he was still highly strung and then charged our vehicle 3 times before running off in a stroppy huff. The cheetah is considered to be a rare sighting in the Kruger, mainly due to their low numbers in the reserve (under 300). This month however has been a very good one for cheetah sightings, the best one being of a lone male. While driving towards Satara rest camp, we came across a collection of vehicles; all peering into the open bushveld. It didn’t take long before we were all looking at a beautiful cheetah, lying in the shade of a small tree, not far from the road. We sat and watched the cheetah for a while, and it was kind enough to stand up, giving my guests the chance to take some great photographs. The elusive leopard is always a pleasure to see, especially when it gives you the opportunity to sit and watch it rest in the shade. While driving along a beautiful section of the Timbavati River, which is generally a good place to find leopards, I managed to catch a movement out the corner of my eye, and there walking along a game path was a leopard. It disappeared down into the dry river bed, so we positioned the vehicle and found the leopard once again moving towards a boulder in the shade. We sat and watched the leopard as it eyed out a bushbuck, walking nervously across the river bed, it made my guest’s day as all they were missing that day was the leopard. The white rhinos have been providing some super sightings, the best one being on route towards the Timbavati picnic sight. It was starting to get cooler as the day drew to an end. We had seen a big bull white rhino in the morning during the heat of the day, and he had been relaxing under the shade of a tree. It was therefore nice to see a crash of rhinos moving slowly just off the road. It consisted of a female with two youngsters, most likely on their way to have an afternoon drink. My guests were thrilled to see a family of rhinos so close. The lion sightings have been excellent this month, while it’s so dry you can often find an array of different animals, together at the few remaining water holes in the central Kruger. The lions have been hanging out near the water holes, looking to prey on the thirsty antelope species as they come down for a drink. The most exciting lion sighting took place at Nsemani dam, while watching a few waterbuck and impala wander down for a morning drink, suddenly all hell broke loose. The antelope had picked up on a very hungry lioness, who was running at full tilt towards them, she had set her sights on a waterbuck, but had lost the element of surprise and didn’t manage to make a kill. She then continued to walk alongside us, as we followed her down the road until she moved off into the dense bush in search of lunch. It was a very action packed sighting, which was topped off by the arrival of two young male lions and the big dominant male, looking very confident with his big mane blowing in the wind. My guests got more than they had hoped for – a great sighting. Elephants live on a tight schedule following a strict daily routine, going down to the water for a swim being on top of the list, this has made for some very entertaining sightings, especially when the youngsters attempt to copy their mothers, but struggle to control their trunk movement and end up putting their whole face in the water to take a drink. The day started with us arriving in the park being greeted by a buffalo crossing the road in the first 200m, but he was in a mind of his own putting his head down and just walking through the bush so sadly not many photos. Shortly after the buffalo we came across 3 bull elephants a bit far from the road but we got photos none the less. Little did we know we would see so many that we would get a little tired of seeing them but that will come later. All these sightings were before we had even got into the park so it was a bonus. After doing all the paper work we set off in Kruger and let the adventure begin starting again with more buffalo and elephants but this time together and we got to see an adventurous youngster challenge a buffalo, he seemed very brave until the buffalo charged back and he went running towards mom with his tail between his legs and stayed there as if embarrassed by the attack. Along the way after the sighting we stopped many cars asking for updates and all we got was a rhino update but having not seen it we headed off there and true as anything we found a beautiful male walking along the river bed but as soon as we got there he hid behind a bush and all the cars went away but I decided to stay and wait and see what would happen, after about 10 minutes of waiting and watching what looked like a rock moving through the bushes we finally got a beautiful sighting of him right out in the open and being the only car there we had prime choice of where to watch him, we sat with him for a bit and took a few photos before heading off in search of the cats. As the day dragged on and the only thing we heard about the cats seemed to be rumours we decided to try a long stretch of road a bit of a distance from lunch but we all had our hopes high that it would pay off, while driving along the road for what seemed like forever with no cars coming our way to give us updates and seeing nothing but elephants and impala our spirits began to drop, until we came around the one corner and there in the shade of a magnificent boerbean tree lay a male and a female lion. Now during our stay with them the male did nothing but raise his head once and give us a glance but the female sat up and looked all around listening to the sounds of the impala nearby and the elephants in the river bed, she eventually flopped back down and went back to sleep but gave us a wonderful sighting ! After the excitement of the lions and knowing we had 4 out of 5 before lunch we headed off towards lunch on another long journey across the bush veld, seeing some beautiful giraffe and zebra along the way. After lunch we headed towards a nearby dam in search of anything there and again we found some more elephants but this time accompanied by some hippo bathing in the dam to escape the beating sun. After watching all these brilliant animals we moved around again looking for more animals but again we found more elephants and of course everyone’s favourite the impala. We stopped countless cars in the hope that they could give us the update we were looking for which was the elusive leopard but no luck. We had basically given up on the leopard as we made our way to the exit and were happy with the day having amazing sightings of everything we saw. We stopped for some elephants one last time before making our way to the exit and while watching this mother elephant, there it was running across the road the leopard, so we sped off in its direction, thinking it must have disappeared in the bushes but it didn’t, almost as if it was waiting for us, it allowed us to snap a quick picture before it went off into the thick bush. While doing a full day in Kruger, we came across six giraffes with a harem of zebras approaching Girivani water hole. The male giraffe spotted two young lions that were about three to four years old lying under a Sicklebush about a hundred metres away. The giraffes stood still, looking in the same direction. Eventually one of the lions stood up and looked at the giraffes. One by one the giraffes went to drink water while the others monitored the lions. When all of them had finished they walked away. We spotted two female warthogs in the middle of the road scavenging a scrub hare carcass which seemed to have been squashed by a vehicle. Warthogs are known to eat some of their babies after birth. They still need protein supplement especially in the dry season because they are the first to take the strain during the drought season. We also saw a few elephants and hippos as we made our way away from Satara. The beautiful thing was the hippos were out of the water and they had their little babies with them. The visual was a perfect five out of five. There was a pair of mating lions lying on Orpen road holding up traffic. One truck that was closest to the sighting made its way close to the lions. The female lion got up and ran around the cars until it made its way into the bushes and went out of sight. The male got up after a few seconds and started running around the cars growling looking for his companion. He immediately picked up her scent and started heading in the same direction as the lioness. He passed the last car and he was very close to the car that the occupants got startled and starting quickly closing their windows. Along Timbavati dry riverbed we viewed a male leopard walking on the sand bank majestically marking his territory. We had a five over five visual of him. We also came across a large herd of buffalos as well as a breeding herd of elephants. An exposition of white ash was seen in a burnt area along Girivani road. As we approached the area we realized that it was an ostrich who was busy bathing in the ash. At first we had thought that it was two animals engaged in a fight. We were busy taking turns to guess what animals it could be only to realize that it was a lone ostrich. He stuck his head in to the ash and after a while started feeding on the ash. 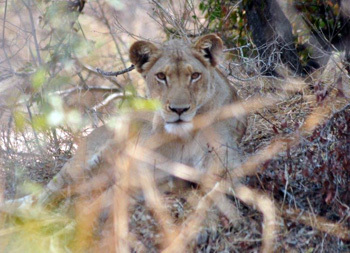 A lioness was spotted twenty metres on the burnt area close to the Orpen gate during the day while it was sleeping. Ten minutes later a three month old cub popped out of the bush and walked towards his mother. The mother got up and held the cub in her mouth and walked a few metres nearer to the road. Both mother and baby lay down next to each other. 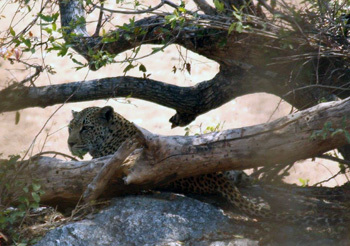 A female leopard was seen on Nwaswitsontso loop hunting impala. We waited for ten minutes. The impala saw the leopard and they all started running away very fast. This month at Viva Safaris has been very good, and busy! I began the month having my 5 days off and in that time I did a Kruger trip with some of my other guide friends. It turned out to be an epic trip as we had really amazing sightings and good fun!! 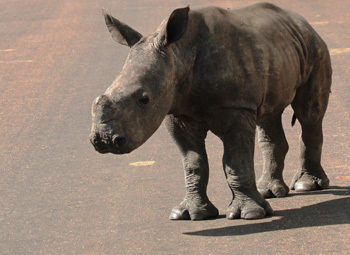 On the last day while driving in the Lebombo mountains in the far south east corner of the Kruger national park 8 km west of the Mozambique boarder, in an area that is being hit hard with rhino poaching we found a lone 2 month old orphaned baby white rhino calf wandering in the road. It absolutely broke my heart, as I watched this dehydrated cut up baby rhino that had gone through the worst tragedy a baby can have call out cries for its mom. The rhino then came up and rubbed up against our car and lay next to our car to seek shade, all it wanted was the comfort of its mom that had been killed only for its horn by poachers. We took action and comforted the baby rhino for nearly two hours giving it water and splashing it with water and most of all giving this frightened helpless little animal all the love and comfort we had, until the Kruger staff came to assist. It was so sad to see what I saw and to experience what is happening to our rhinos. 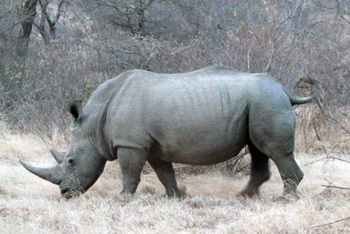 We helped save one rhino, one day this rhino will hopefully be back in the wild living free. After this event on my time off, this month at work guiding, my passion and love for wildlife has never been stronger!! I have had some more amazing guests and the sightings have been absolutely incredible. On bush walks we have had lots of action with hippos, crocodiles, rhino, elephant, buffalo, birds, general game and more. 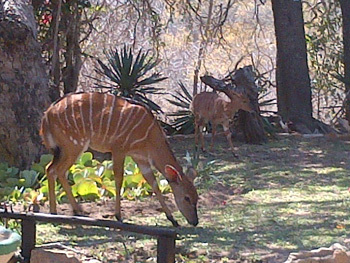 We have had a lot of animals coming to the lodge and the Marula Boma this month. A large well known bull elephant came by one afternoon and stayed around the lodge for over 6 hours, we also had a giraffe that is very comfortable around people, and the regular herd of buffalo, monkeys, warthogs and guinea fowl that are usually around the lodge. At the Marula Boma braai out in the middle of the bush, there have been sightings of genets, hyena, honey badger, elephant and leopard all right outside the Boma. The drives have been wonderful with really good sighting of big game, lots of elephants and buffalo herds, nice sightings of both black and white rhino and even a few cheetah sightings!! The bush is thriving right now as summer is on its way!! It has been another good month in the bush here at Viva Safaris. On the first of September I did a Sunrise Drive at Tremisana and we came across a herd of buffalos. Some were sleeping close to the road. On our way back to the Lodge we were lucky to see a cheetah busy marking its territory. It was a very good view. The guests were really happy with this sighting. After breakfast we made my way to Kruger National Park. Just as we entered the park we came across seven buffalo bulls close to Orpen Gate drinking water. Two kilometres further on we saw three lions sleeping in the shade of a tree a few metres from the road. The clients were very excited that we had a very good start. As we continued with our drive we saw a lot of elephants close to the river busy feeding. Near Satara camp we found two lionesses hunting some wildebeest but unfortunately they were not successful. The wildebeest saw them early and ran away for dear life. We also saw four big bull elephants with long tusks heading to drink water at the waterhole in front of Satara Camp where we had stopped for lunch. After lunch we drove on the S100 and found a pride of lions eating a waterbuck. The pride had some little cubs as well and one was white. The guests were very happy to see a white lion cub. I also found a large herd of buffalos at Gudzane dam drinking water. It was amazing to see the buffalos all over the dam. They were about two thousand buffalos – the largest I have ever seen in many years of guiding. I drove around the S45 and S90 where I found four white rhinos grazing in the open area. There were three females and one calf. They were lovely to see very close to the road. We also found one bull white rhino sleeping ten meters away from the road and there were a lot of elephants as we made our way out of the Park. We drove to the Olifants River to conduct the bushwalk. We found six buffalo bulls sleeping close to the road near Tremisana Lodge. We walked into an elephant that had just pulled down a thorn bush tree. We spent a lot of time watching the elephant. We then walked towards the river and saw a lot of hippos as well as some crocodiles. It was a lovely day and the sighting was very perfect. We also came across a lot of general game – a lot of giraffes as well as zebras as well as the ever present impala. The next bushwalk that I did was more exciting. We came across a male cheetah on our drive back to the lodge. We stayed with the cheetah for about thirty minutes until it stood up and went into the bushes. During another bushwalk as we were driving to the walking spot, we were all excited to see a male lion stalking some impala. We all sat quietly, excitedly waiting to see a possible kill. We were all disappointed that nothing happened and the lion gave up . He simply walked away in the opposite direction. We also came across a herd of elephants that made a quick crossing in front of our vehicle. 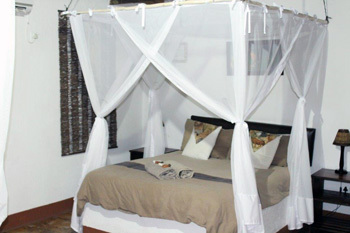 All chalets now have mosquito nets over each and every bed. We have retained the insect screens on the windows and with air conditioning in every room, we are certain that our clients will have a great mosquito-free sleep. We have moved our reception/office to the front entrance of the main lodge adjacent to the curio shop. We now have an additional bedroom in the main lodge. We will use it to host another intern. With the successful internship relationship we had with Michelle Golding, we have reached an agreement with the International Hotel School to host 3 more interns. 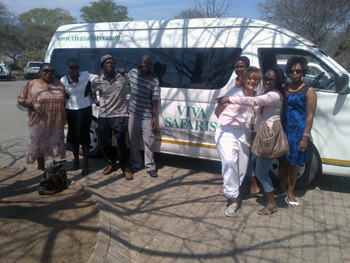 Michelle had such a great time with Viva Safaris – she was in tears on the day she left. We thank her sincerely for joining our family and fitting in so easily. A buffalo herd has moved in permanently – we have seen them at all hours around the waterhole. 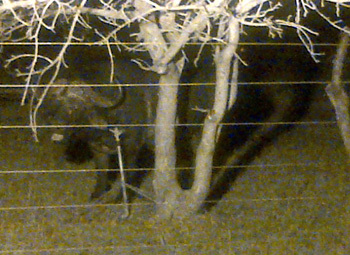 They come right up to the fence – I took the photo below late one night. We have re-thatched units 10 and 12 and have added steps to the ablutions for the tents. It has been a busy time varnishing all decks and poles before the rains. Each unit is now described in detail, and photos of the exterior, the interior and the view from the deck have been posted under “Accommodation”. Leopards have been seen a lot more this month at Marc’s Camp. Sightings were had at the front gate, along the Klaserie River just past treehouse 9 and also on the bush walk. The calls of leopard are heard very frequently and we have come across no fewer than 4 nyala carcasses. 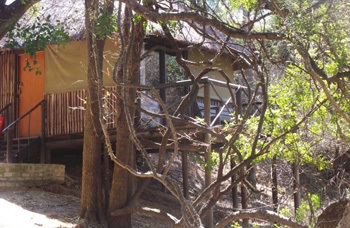 Guests can now see which treehouses are on stilts and en suite and which are original treehouses that have designated non en suite ablutions. The 2015 fly in safari and luxury lodge safari tariffs are imminent – I shall send an email in this regard on or before the 7th October 2014. Booked through STA travel agents as part of viva safaris. We arrived at Tremisana in the afternoon after a long drive from Johannesburg. We were welcomed by staff with the best lemonade in the world! The showed us to our lodges, which were really spacious and culturally decorated. The bed was comfortable and the room has all amenities you could need. The grounds were beautiful, there was a pool, and you are surrounded by the bush. There was buffalo grazing as we stood meters away on the other side of the fence. Monkeys swung room trees, and were really funny to watch fighting- keep your door closed, and food very close as they will take it in seconds. The tours always ran to time, we were never kept waiting, we were very lucky at the time of our travel it wasn’t very busy and we had a lovely young lad called Chris who took us out for the two days and showed and taught us loads. We went on a night drive, and they cooked us a meal in the bush, which was lovely, a morning bush walk where we entered the heart of the bush on feet and saw all the little but still amazing things you cant see from the inside of a jeep. Breakfasts were fantastic! Couldn’t ask for a more fulling or more variety. Just what you need to start a day on safari. Staff were lovely, wish we could have taken the naughty baby monkey home that all the others kept picking on. on talking to other travelers too, they all found viva safaris the most competitive when booking both in Africa and in the UK. Experience of a lifetime, the big 5 are worth the trip, would love to do it all over again oneday. We went as a young couple, but the age range was vast, from single people of all ages, to older couples and families. 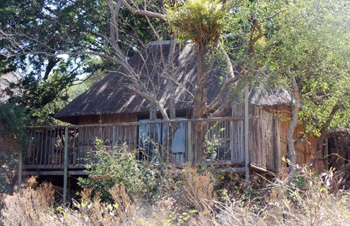 Environment: Tremisana is located in balule game reserve, so you get a sense that you’re really in the African bush. Large wired fences surround the lodge to prevent animals from coming in, so it is pretty safe. There are places to chill like the bar, TV area, small pool in between outings, but we just stayed in the room and slept as we’re were jet lagged. Customer Service: We rate the level of service highly, from the intern who came out to greet us every morning/evening, to the very knowledgeable/well informed rangers who made sure we saw as many animals as possible. We came away from this with a better understanding and appreciation of wildlife. Vivas 4D3N Itinerary: With it being our first time in SA, we were happy to have a structured itinerary and felt we maximized everyday. Highlights included: coming face to face with a lion on our first night safari at Balule; seeing the remaining Big 5 within three days; visiting Kruger National Park and seeing all sorts of animals roam freely; stroking a tamed cheetah name Ntombi at Tshukudu (aww); getting up close with rare rhinos. We loved it. We should have stayed an extra day. we stayed here in June 2014 and loved it, including our pet lizard that housed with us hiding behind the mirror 🙂 we stayed here for 2 days and although it was the winter months we were still more than warm enough. the staff were very friendly, especially Pretty! 🙂 Everyone who was there loved the food, especially the butternut squash soup! Lovely area and lovely grounds. walking back to the treehouse was pretty scary late at night so make sure you take a torch as you are in the bush, surrounded by animals including leopards. our stay at marcs treehouse lodge was wonderful we found the accommodation rustic but clean and quite which added to its charm, the game viewing was excellent with our guides both knowledgable and helpful. the food was lovely and plentiful. the staff were both friendly and charming my wife and I thoroughly reccomen this lodge for any future travellers to this part of the world. steve and lynne moore Brisbane Australia. I just wanted to say thank you and let you know how much we enjoyed our stay at both Tremisana Lodge and Marc’s Camp. We also appreciated your patience and direction in assisting with getting our visit scheduled. Please share this with staff and owners alike: everyone was very knowledgeable, congenial, helpful and a pleasure to be with. It was much more than just seeing wildlife in their environment. It was learning the facts and details of the history, the land, the people, the native plants and animals that rounded out our experience. It was meeting new people and learning about their history and experiences. We also appreciated the last minute arrangement for us to spend our last evening near the river at Marc’s Camp. Our morning bush walk was well worth getting up at 5am for! Food was delicious, accommodations were more than comfortable and the surrounding grounds and landscape beautiful (at both sites). Many thanks to those staff behind the scenes. 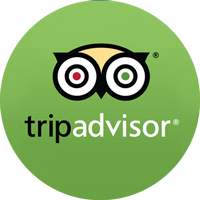 We will most definitely recommend Viva Safari’s to prospective customers.